It was a whirlwind tour month for me. 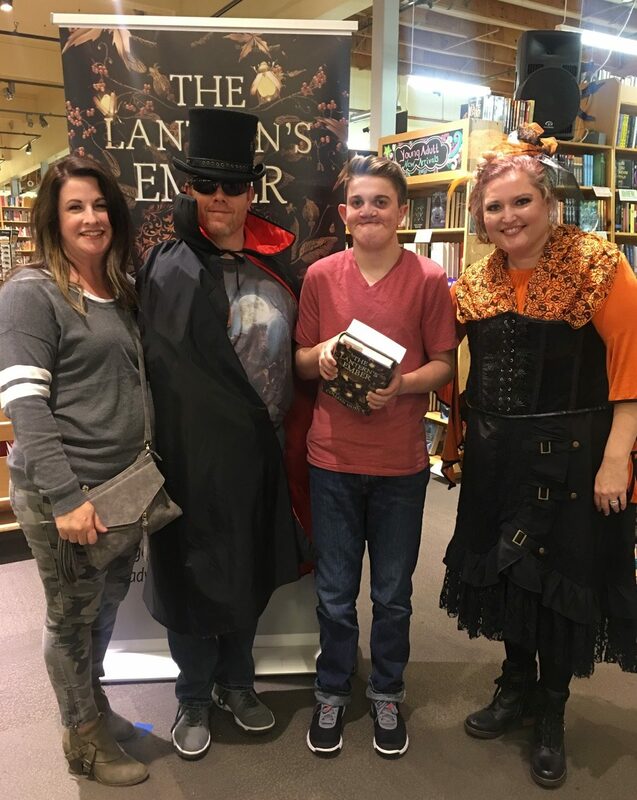 I was kept very busy through October with travel and got to see many of my readers as I promoted The Lantern’s Ember. For those of you who missed seeing me, here’s a recap of what happened. 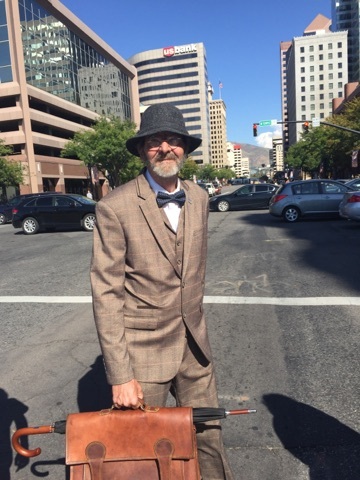 I started off at Salt Lake Comic Con, doing four panels and two book signings. 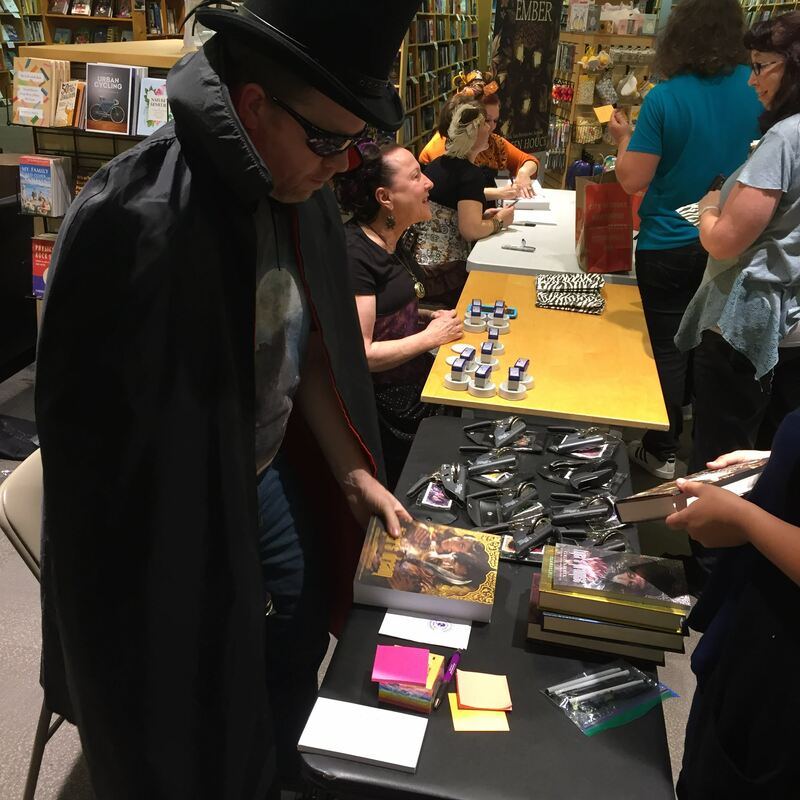 My book signings were amazing and I was kept busy the entire hour on each signing day despite the fact that the wonderful sponsoring bookstore ran out of The Lantern’s Ember before my second book signing. Somehow, I managed to get through the line both days most likely because I didn’t write my customary sentence that goes in each book. I now have a cheat sheet for those, by the way. There are simply too many books out now for me to remember them all. As you can see from my standard sentences below, I’ve shortened them quite a bit from when I started. I took all my book stamps with me to Utah and included the embossers in Oregon but those embossers are far too heavy to take on tour these days. I do have complete sets of embossers for the entire tiger series and the Egypt series but they only go to local events now. Going forward I’m determined to go with stamps. Here’s what they look like. The embossers are identical. The only difference is that there isn’t any ink. It just embosses the pattern instead, using muscle, which I typically need to sign books with anyway. 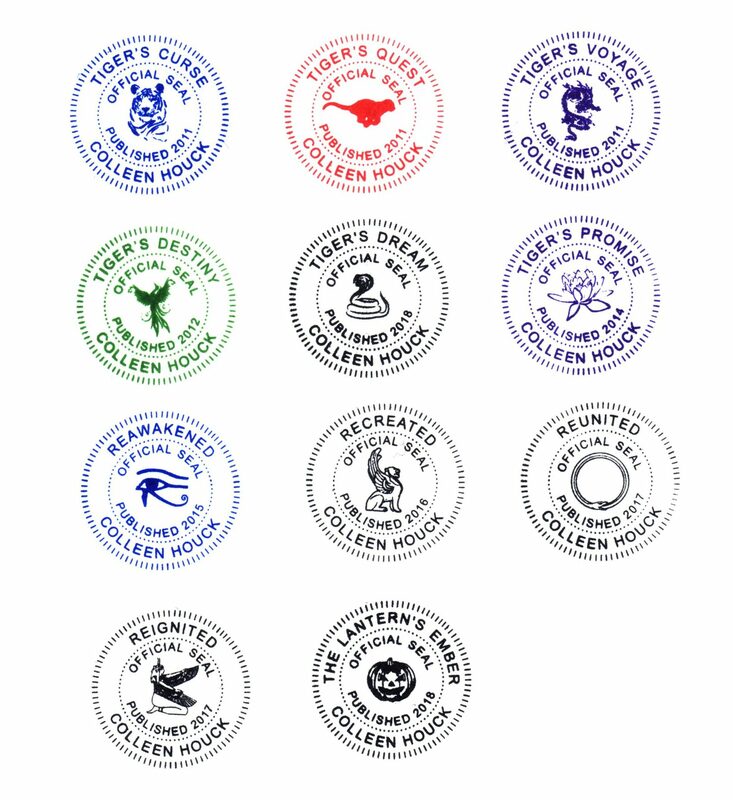 As you can see, there is a symbol that goes with each book. If you’d like to know what I write in each book (and this is only when I have time to do so on tour) here you go. TIGER’S CURSE-Bhagyashalin! May you be endowed with luck! TIGER’S QUEST-Find your North Star! TIGER’S DREAM-May all your dreams come true! TIGER’S PROMISE-It all begins with a promise! REAWAKENED-Let the sun shine in! THE LANTERN’S EMBER-Stir the embers! David Tennant (AKA Doctor Who), LOOOOVEEEE him! Allons-y! 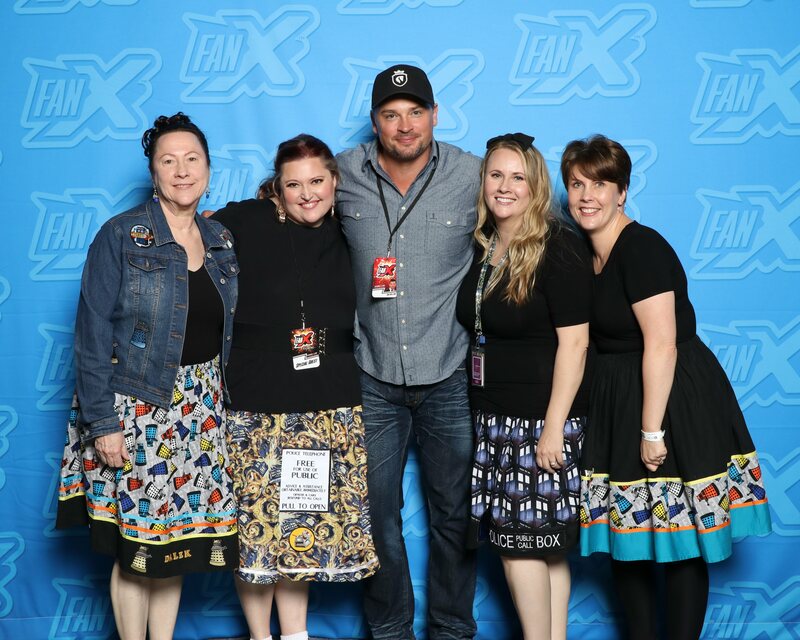 And Tom Welling from Smallville. My mom and one of my sisters flew home to Portland early and saw him waiting for his bags. He was on the same plane. Turns out his girlfriend lives in southern Oregon. My nephew was photographed for the local newspaper because he made a sweet costume. He was totally sweating to death but sacrifices must be made for Cosplay. He’s the silver one-eyed rabbit thing. 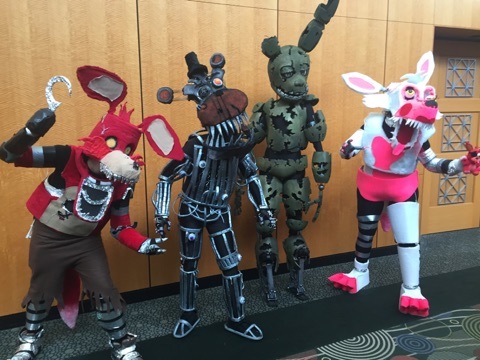 He says it’s from something called Five Nights at Freddy’s. Never heard of it. He’s the second from the left. It was awesome just walking around and seeing all the costumes, including those worn by my readers. 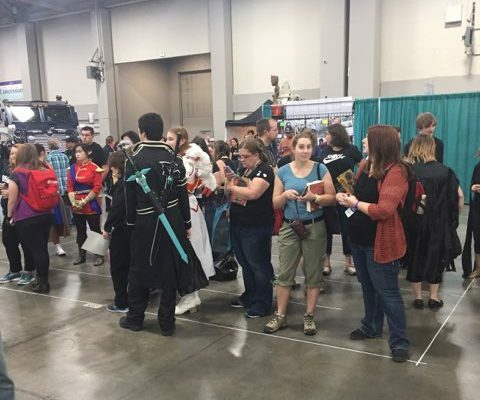 I dressed down at the con just because my days were pretty full and unlike my nephew, I didn’t want to be engulfed in sweat, but you’ll see my costume for The Lantern’s Ember at my other events. 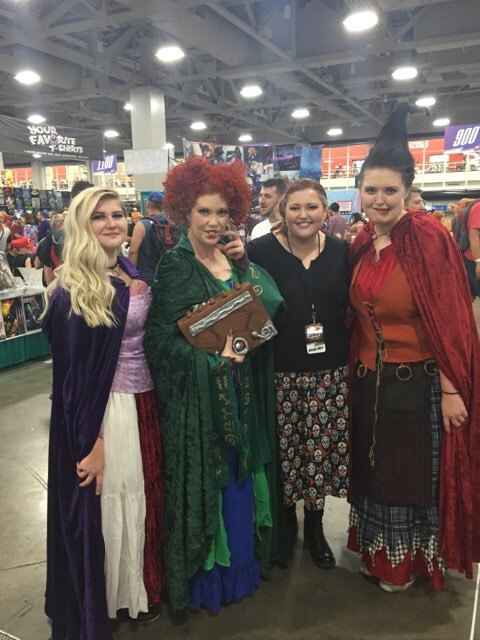 I so want to wear these Hocus Pocus costumes with my sisters someday. These ladies were perfect! The redhead even had the buck teeth and the boooooook! We kept trying to show my mom this guy but she was never looking when he passed by. She’s a huge fan of Sean Connery. If you don’t know this costume you need to watch Indiana Jones. 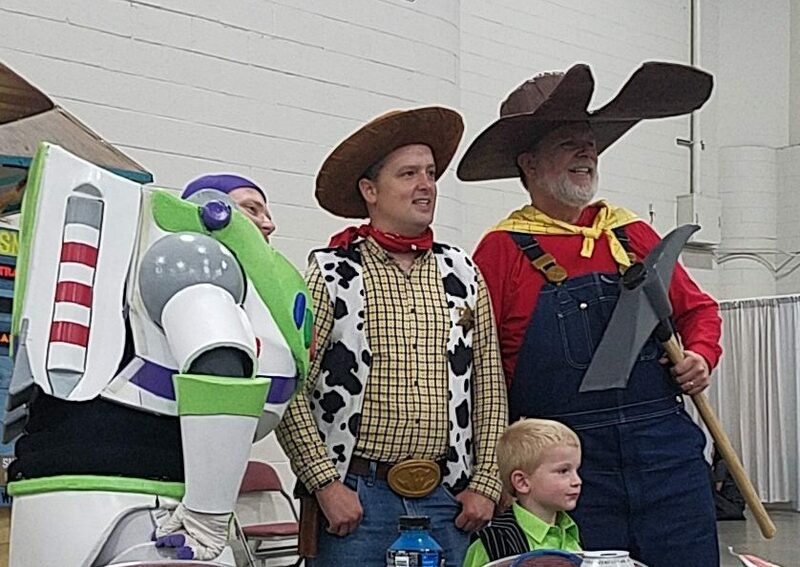 This whole family dressing up as the Toy Story characters was so cool! We shared a lunch table. Here are some of my readers waiting in line to get their books signed. After the con was over, I kept only one sister with me though I would have kept them all since they are all extremely helpful, and put the rest of them on a plane back to their families. 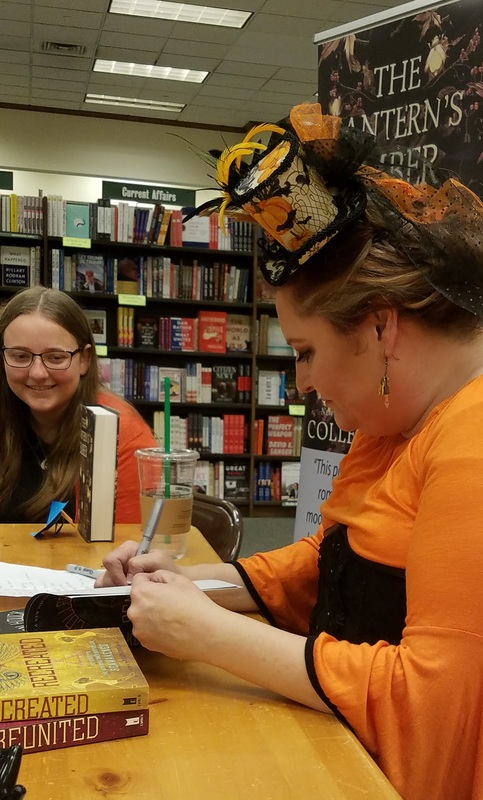 Shara, the blonde sister, did all my hair and makeup at my two bookstore events and even coached my makeup via Skype for my local stuff, which is an amazing feat, but she also helped stamp all the books, took pictures, organized me and the lines, checked us in to our hotels, got us food, and everything else. I couldn’t ask for a better assistant on tour. If I can, I like to do giveaways at my book signings. It’s hard to do if I’m on an extended tour since I can’t pack too much. In this case, I was able to ship some fun things to the bookstore ahead of time. I like finding decks of playing cards that go with the theme. I found lots of steampunk, zombie, skull, and monster playing cards. 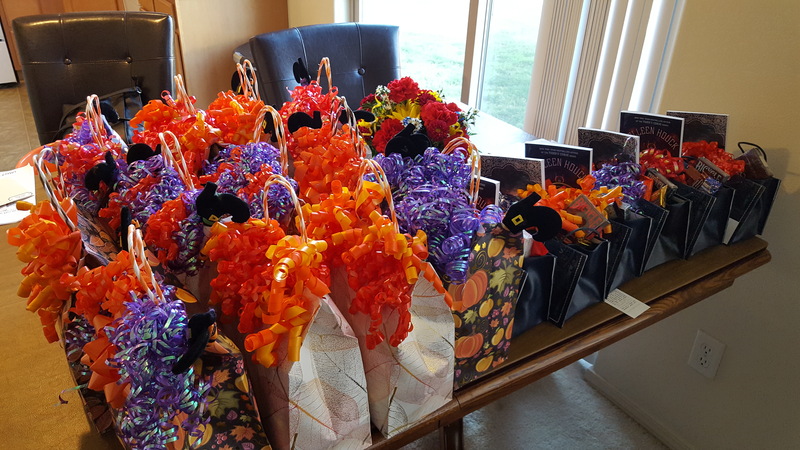 Then the bags usually include fun things that match either the color or theme of the book. 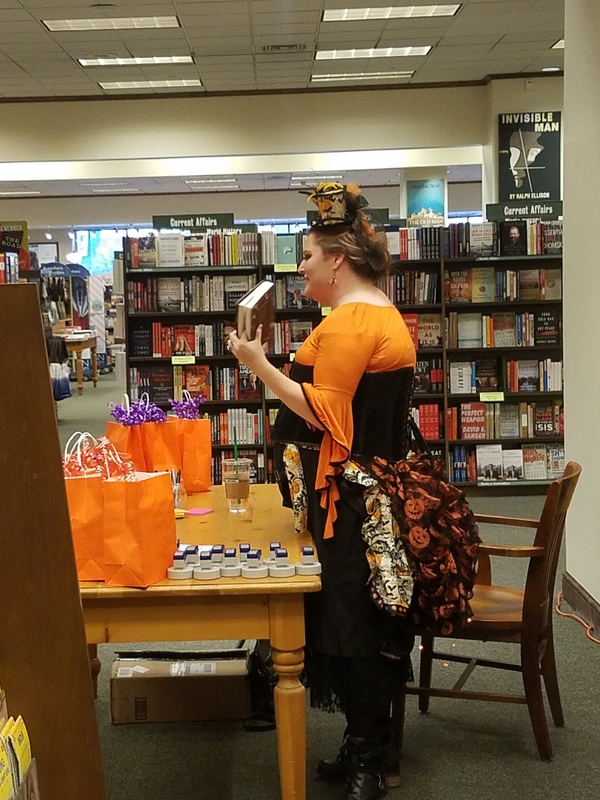 For The Lantern’s Ember, it was orange and purple and Halloween, so lots of candy, orange and purple nail polish, some makeup, I always throw in either a copy of Tiger’s Promise or Reignited or an audiobook. Then whatever else I find as I shop. In the back, you’ll see some Reawakened purses I had made out of library editions. 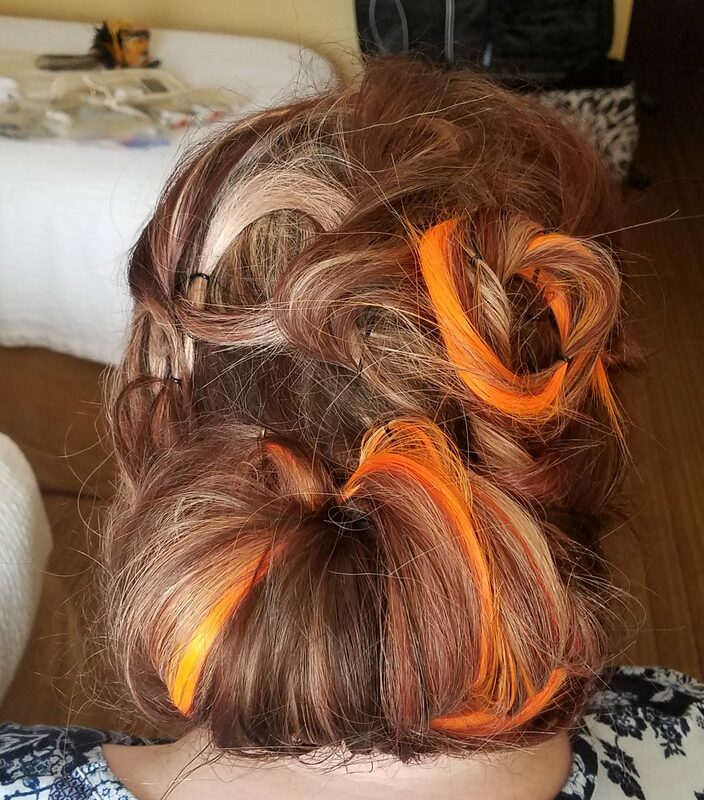 I bought some orange extensions for my hair to go with the Halloween theme. It looked really cute from the back but I think I look better with my hair down for pictures. 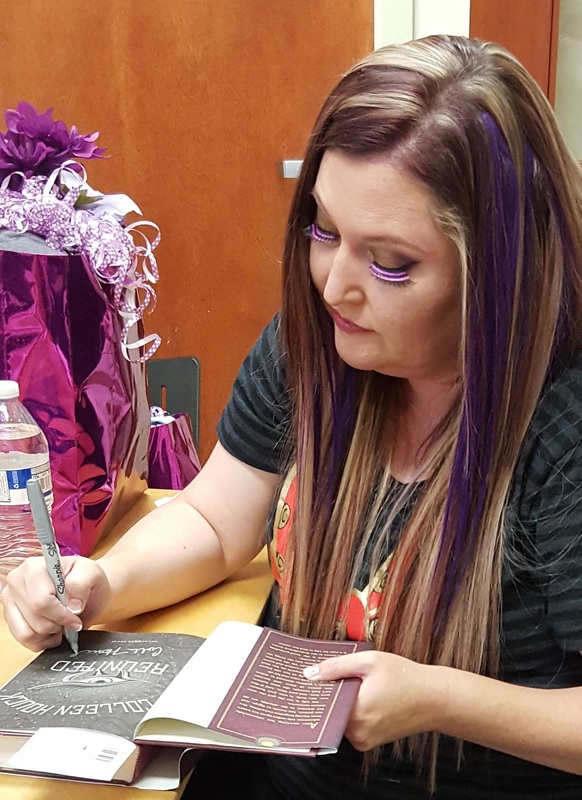 During the Reunited tour, I wore super long hair extensions straight down my back with purple highlights to match the cover and almost passed out during the Q & A. Between the hair and the dress I was super hot! 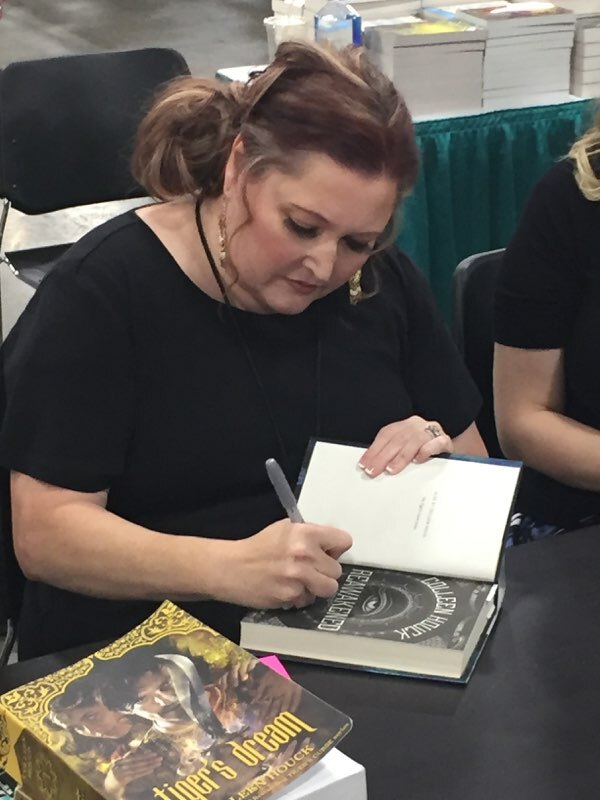 Note to self: Drink water before a signing! 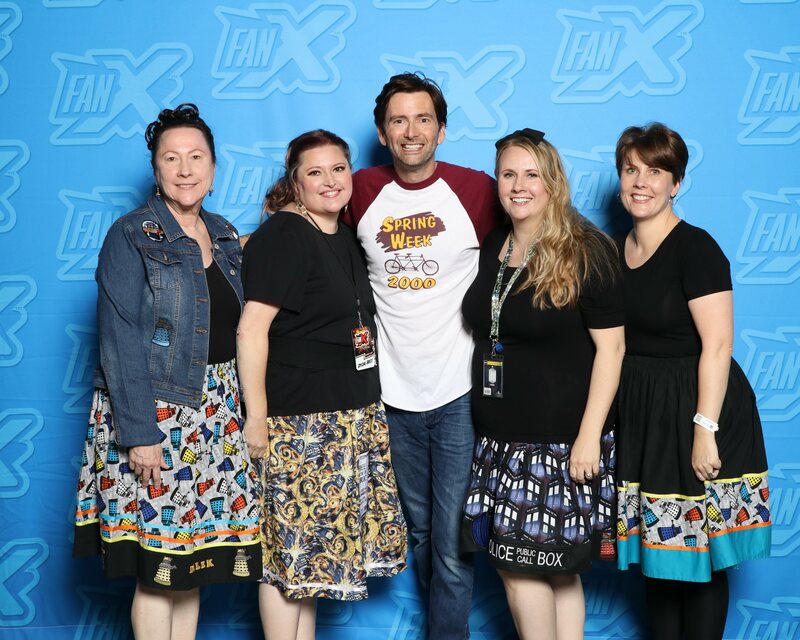 A few Salt Lake Comic Con’s ago, I found this lady at a booth called Kyla’s Keepsakes selling comic book bustles and ended up buying three of them. 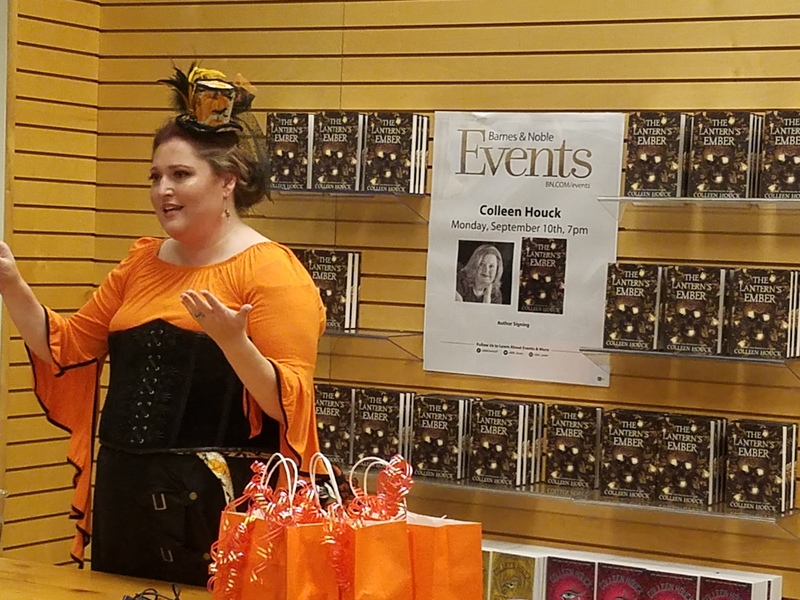 She made me a custom light up bustle and hat to go with my Halloween book. The hat has netting, feathers, pumpkins, and a black cat. I also wore firefly earrings I bought on Etsy. I love the pumpkin colored shirt mostly because the sleeves are awesome. 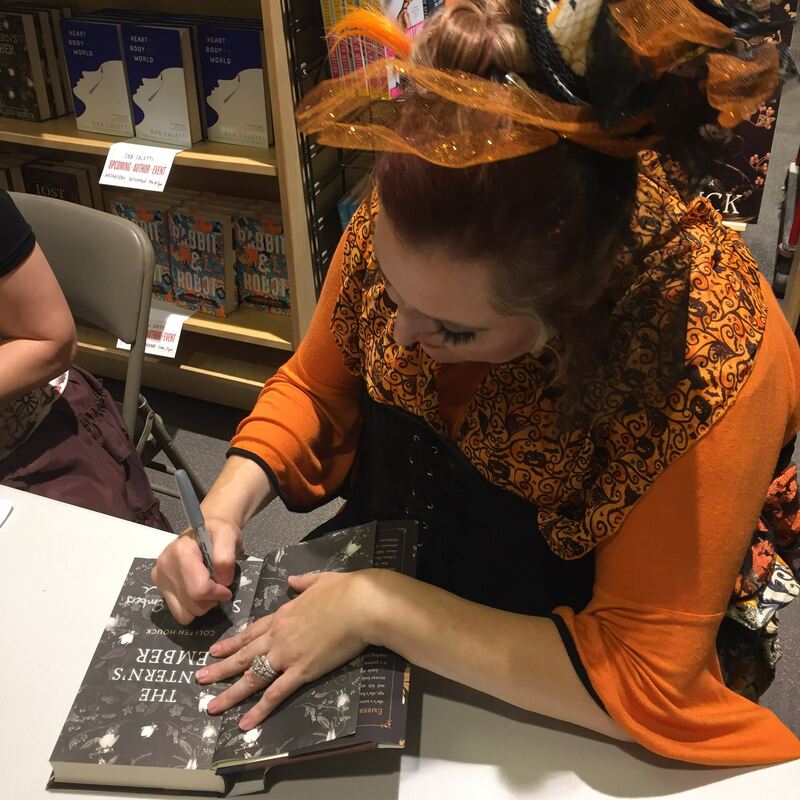 It was too clingy for my taste though, especially when topped with a corset so I added a Halloween scarf when I got back to Oregon. The skirt is a pirate type with buckles, then I wore my steampunk ankle boots. I’ll show you a better picture of the bustle below. So the bustle actually has three layers. 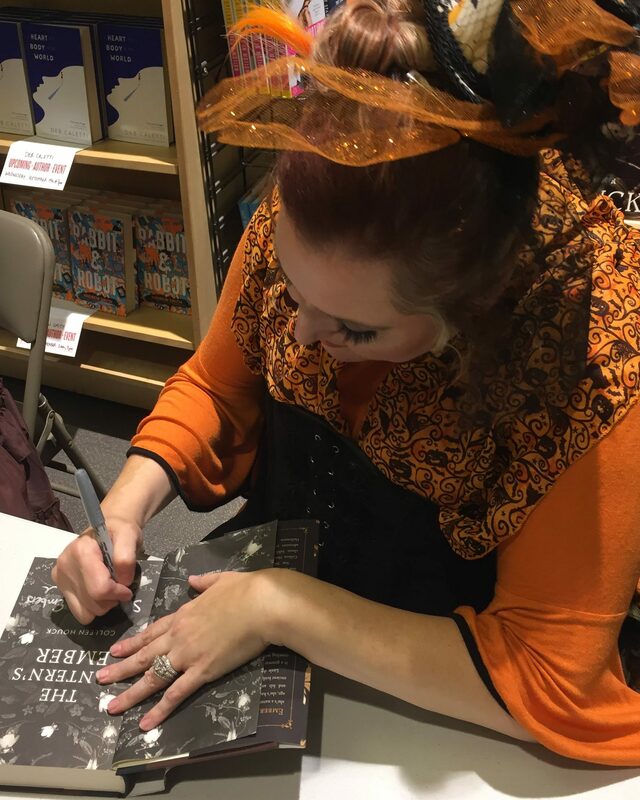 It’s black on the bottom layer, then the white with pumpkins and bats that matches the hat, then the top is a black and orange pumpkin lace topped with chains with various charms like cauldrons and broomsticks. Beneath that lace layer are two strings of hidden Halloween lights and a battery pack so the whole bustle lights up. It got tricky that first night since it became detached somehow during my flight and I didn’t check everything. After the first night, it worked much better. 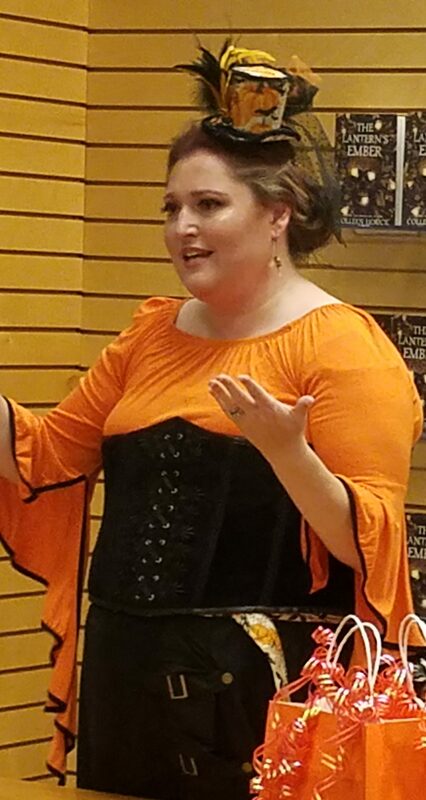 Also, I figured out after that first night that the bustle goes on before the corset, otherwise the ties start slipping down and peeking out underneath. 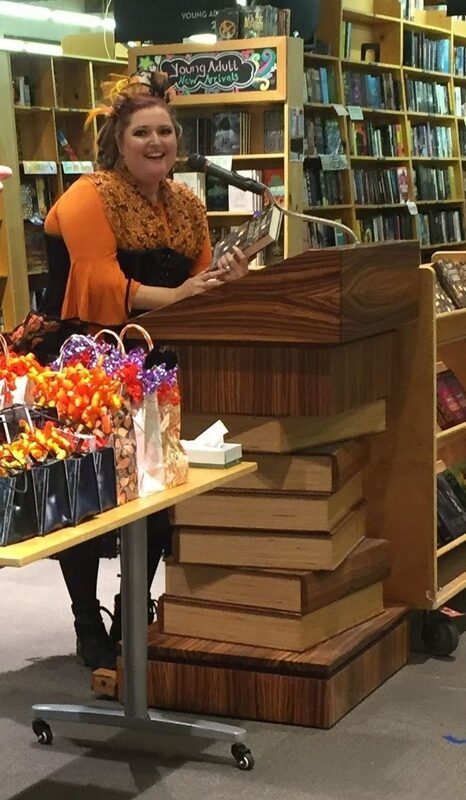 I was a bit of a hot mess, costume-wise, in Orem. It was a great crowd though with lots of questions and many longtime friends in attendance. In addition to my sister, her eldest daughter, my niece, Becca, who I named Kelsey’s foster sister after, was able to take a break from her freshman year at Brigham Young University. She came to help me at the signing and spend some time with her mom. She gave up two full-ride scholarships at Arizona Universities to attend BYU where she’s majoring in Computer Engineering. She’s a bit like Kelsey actually. She loves baking, and when we asked her what we could get her before we left the city, she said she needed oven mitts and toothpicks to test her cakes. Smart and a baker? I’d be shocked if she didn’t have a line of guys signing up with her for tutoring this semester. 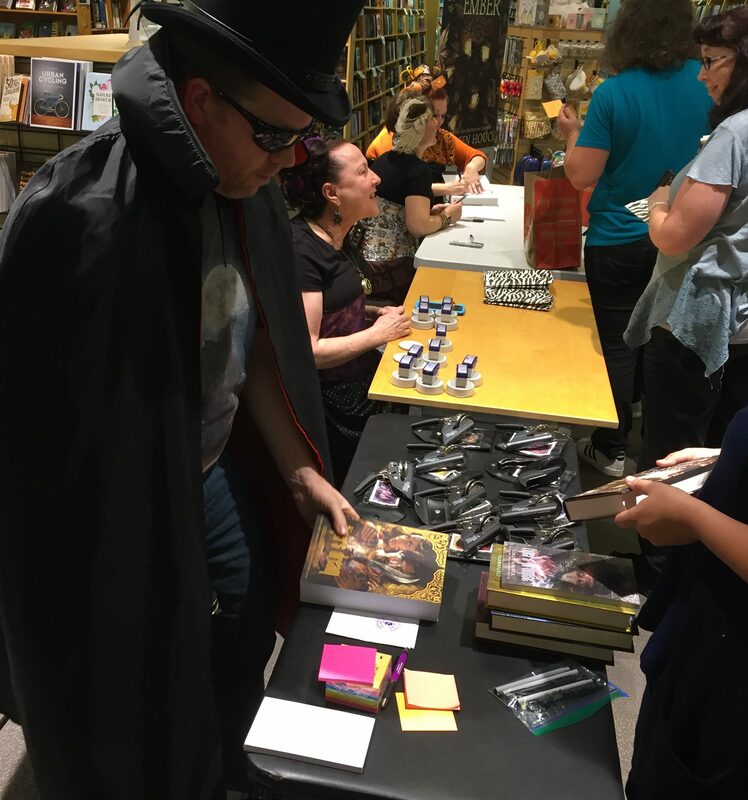 Back in Oregon, I had two more events, one at Powell’s and one at The Book Bin in Salem. Both were fantastic! At Powell’s my mom, hubby, and sister dressed up along with me. 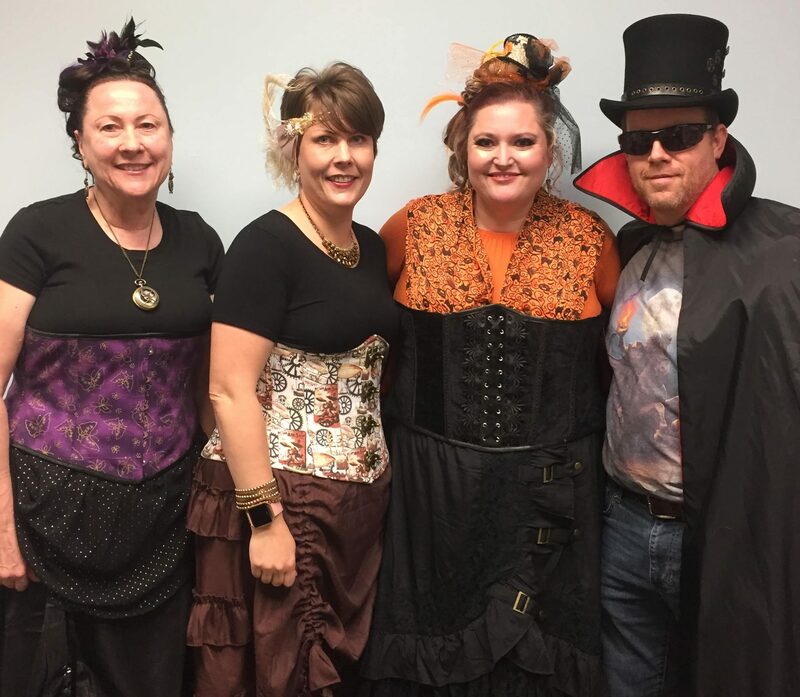 The hubby wore a steampunk hat and a headless horseman T-shirt but didn’t dress as dapper as my vampire, Dev. He thought the sunglasses were making him mysterious. A fun surprise waited for me at Powell’s. 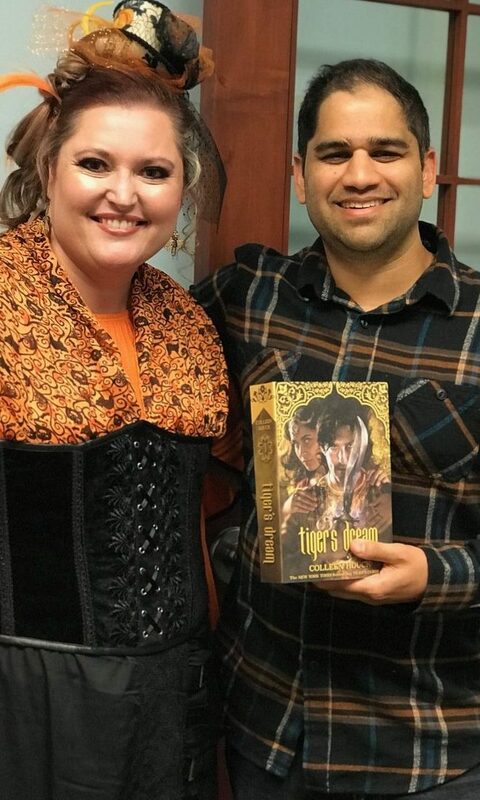 I got to meet Neil Shah, the actor who is narrating the audiobook of Tiger’s Dream! 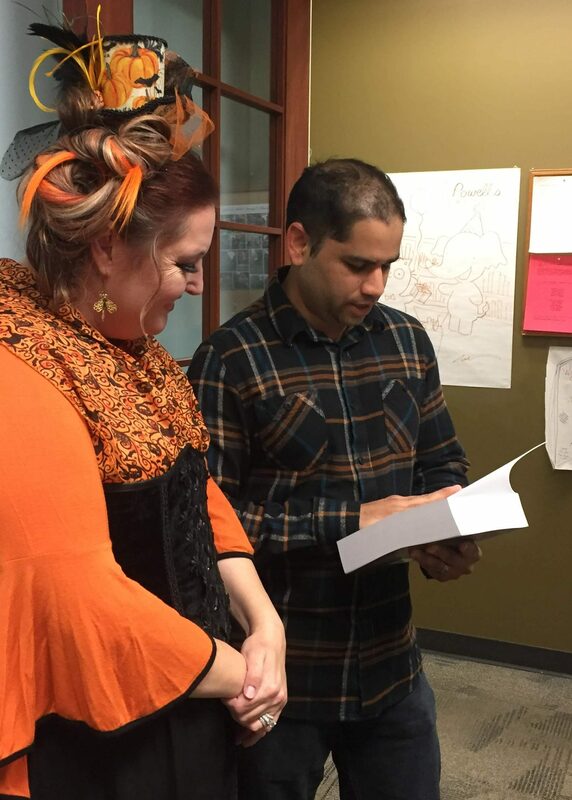 He read the opening scene in Kishan’s voice for me, the one where Kishan is hunting the deer as a tiger. 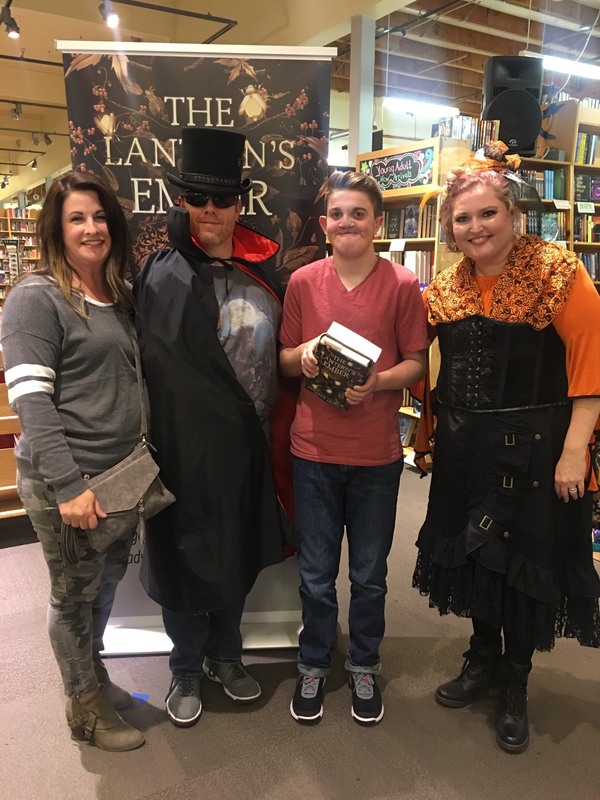 Even though he was feeling under the weather and couldn’t stay long that night, I can tell you, you’re all going to want a copy of the audiobook just so you can hear Kishan’s voice. 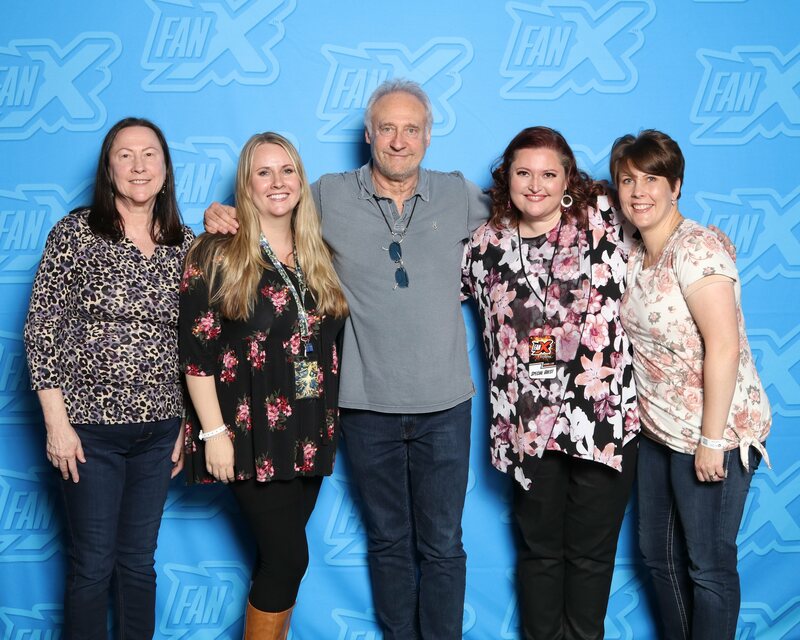 Neil’s amazing and what’s even better is that he lives in Portland and promised to come to another signing someday and do a reading for you guys! If you want to hear a short sample, check out another tiger book he narrated on his website. A few of my favorite moments on the tour were when a mom and her adult daughters were visiting with me and the mom told me her favorite book was Tiger’s Promise because, without Yesubai’s gift, nothing else could have happened. Her insights into Tiger’s Dream and Tiger’s Promise were amazing. I could have talked with her about the story for hours. Another fan told me about her journey to the Tiger’s Dream party in Salem where her car broke down and she had to take a taxi, but the driver only took her as far as Eugene. So she took another taxi and had to do the same thing going home. I was surprised that she sacrificed so much to come but she said she’d do it again and had a great time. I saw a few of my old self-published versions of Tiger’s Curse and Quest on the tour which means someone’s been carrying those books around for the better part of ten years or so now. There were a lot of first editions and entire sets brought to the table. 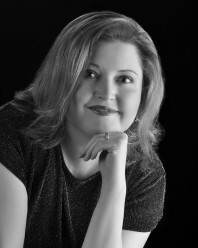 I’m so grateful for all the support and love I feel when connecting with my readers. 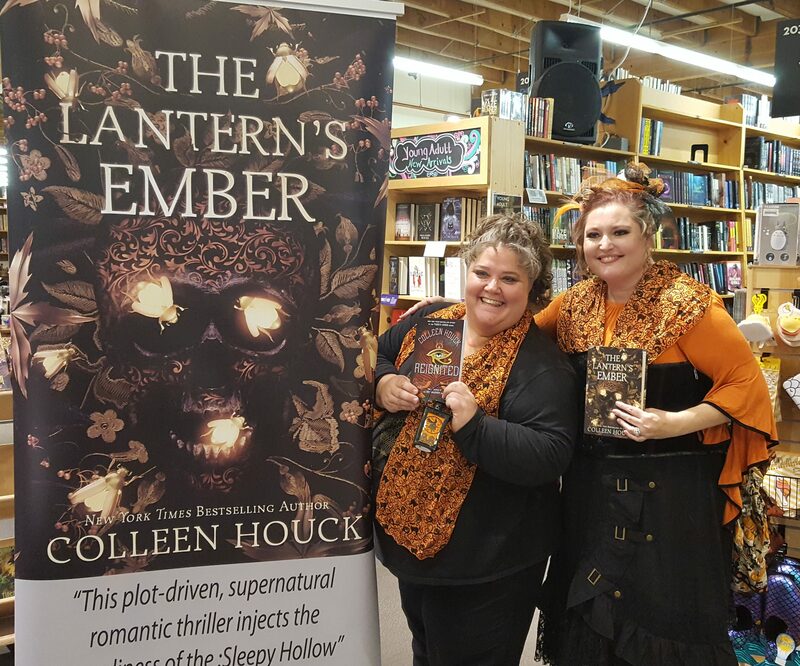 Thank you so much to everyone who came out to see me and to all of you who weren’t able to come to the launch parties but celebrated in your own way and picked up a copy of The Lantern’s Ember. I hope you love this Halloween story as much as I do and that it puts you in a Halloween mood! If that doesn’t do the trick, then may I suggest watching Hocus Pocus! This entry was posted in The Lantern's Ember. I wish I could have met you at Comic Con. I absolutely LOVED The Lantern’s Ember! Such a fun and engaging read! I finished it in 2 days, I only put it down to sleep, go to work, and take care of my family, lol! My birthday is on Halloween and that book really put me in the Halloween mood! So glad you liked the book! I just finished reading the Lantern’s Ember because my local library was so late getting it. It was just as I expected. Aw thank you! So glad you liked the book!